A 1937 Chevrolet Truck alongside a 1932 Chevrolet Cabriolet makes one wonder why the Fords of that era become so popular. The biggest major reason is pretty well known by those that are knowledgeable about the era. Flathead V8 Fords captured the attention of anyone who wanted to go fast at an easily affordable price. The 1932 Chevrolet Cabriolet was also of structural wood construction and didn't last as well as the Fords that were all metal in 1932. The 1937 Chevrolet Truck was the first year for all metal construction in the Chevrolet line. There were high end cars that would go faster than the 1932 Ford, but the cost was prohibitive to the average person, just as those Classic Cars are out of reach to the average collector today. 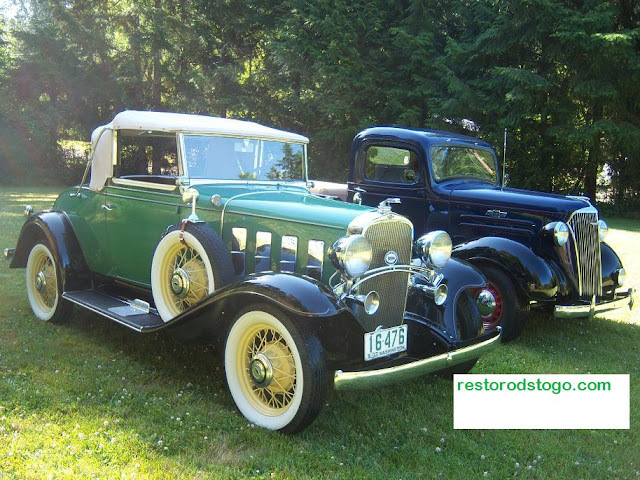 The 1932 Chevrolet Cabriolet belongs to a client, and the 1937 Chevrolet Pickup Truck is my own, both of which I restored. I drove the 1937 Chevy, solo, from Seattle to North Carolina and back, in 2007.